(1) Walter Tynan, in special election 7/27/1946, succeeded J. Franklin Spears, died 5/29/1946. Members of the Texas Congress 1836-1845; Members of the Texas Legislature 1846-2004, 2005. (2) 46th Legislature - 1/10/1939, pp. 1-2, listed in "Roll Call of Senators. . .who were Members of the Forty-fifth Legislature and whose terms of office continue for the duration of the Forty-sixth Legislature." Senate Journal. (3) 45th Legislature - 1/12/1937, p. 2, listed in "Oath of Office Administered to Senators-Elect." Senate Journal. 50th Legislature, R.S., SR 18, 1/27/1947, p. 80. Resolutions - Memorial. Biographical sketch and portrait, Franklin Scott Spears, Associate Justice, Texas Supreme Court, 1979-1990. Relatives: J. Franklin Spears - father, Franklin Scott Spears - son. Justices of Texas, 1836-1986 (Tarlton Law Library, The University of Texas at Austin), 2004. World War II service, Lieutenant Colonel, "Legislature Faces Problem of Absences: Men in Armed Forces Can't Get Leave to Attend Sessions," 1/1/1943. Dallas Morning News. World War I and World War II. Spears "also served his country in both World Wars. He served in World War II with great distinction, having received the rank of Lieutenant Colonel." 50th Legislature, R.S., SR 18, 1/27/1947, p. 80. Resolutions - Memorial. 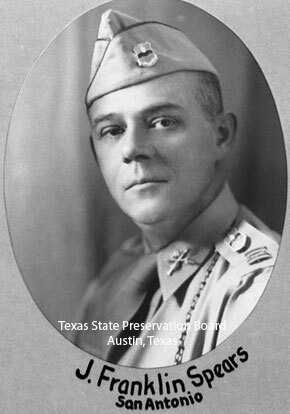 Pictured in uniform in 47th and 48th Senate composite photo and listed as Lt. Col. J. Franklin Spears. State Preservation Board. United States Cavalry, World War I; United States Army, Lieutenant Colonel, World War II. "He entered the Army as a National Guard officer in 1940 and was separated in 1944 as a Lieutenant Colonel. At 17 he had enlisted in the U.S. Cavalry, serving during World War I." Memorial, October 1946, p. 410. Texas Bar Journal. Memorial, October 1946, p. 410. Texas Bar Journal.